Educate the public and promote and encourage amateur astronomy in general. 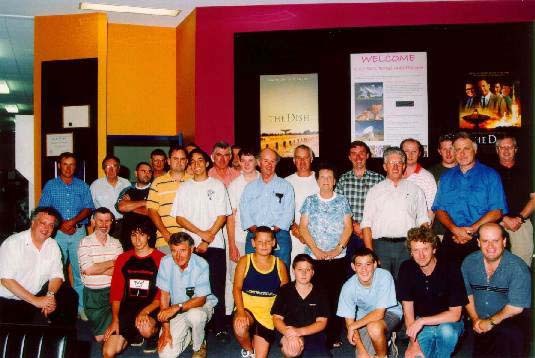 Group photograph taken at the inaugural meeting of the Society on 1 February 2002, held at the CSIRO Parkes Observatory Visitors Centre. On Friday, 1 February 2002, the Parkes Radio Observatory played host to the inaugural meeting of The Central West Astronomical Society. Amateur astronomers from all parts of the Central West of NSW attended the meeting. People from as far afield as Parkes, Forbes, Orange, Canowindra, Dubbo, Narromine, Trundle, Bogan Gate, Tichbourne and Cookamidgera attended. In addition, three visiting Melbourne University students made it a national event. Dr. John Reynolds, the Officer-in-Charge of the Parkes Observatory, welcomed the members and expressed his support for the society and its aims. The society in turn expressed its gratitude to Dr. Reynolds for his support and goodwill in allowing the meetings to be held at the Observatory with the magnificent Parkes Dish as a backdrop. The Central West of NSW is a vast area, boasting some of the darkest skies in NSW. In addition to the many private observatories, the region is host to numerous professional astronomical facilities, such as the Parkes Radio Observatory, the AAO and Siding Springs Observatories to the north, and the Mt. Stromlo Observatory and the Tidbinbilla tracking station to the south. Remarkably, a society did not exist to cater for the needs and aspirations of the large numbers of people in the region who are fascinated with the night sky. Recognising this need, a group of amateur astronomers from the district; John Sarkissian, Chris Toohey, Alex Abbey, Peter Cannon and Jim Buckley, got together and founded the long overdue society. The society meets on the FIRST Friday of every month at the Parkes Observatory Visitor's Centre from 7:30 pm. People of all ages and experience are welcome to attend these monthly meetings. No prior knowledge of astronomy nor ownership of a telescope are required. Only a keen interest in, and an enthusiam for astronomy and the night sky, are all that is required. The monthly meetings, include a regular program of guest speakers, films, discussions and observing reports. In addition, separate monthly observing nights enable members to interact and pass on their observing skills and knowledge of the night sky. Since its inception, the Society has grown in leaps and bounds. In addition to the many great speakers that regularly address the Society, the public outreach activities of the CWAS have increased in scope and stature. In 2004, the CWAS AstroFest was inaugurated as the main fundraising and public outreach activity of the Society. It has been phenomenally successful. Also in 2004, the "David Malin Awards" were inaugurated as part of the AstroFest. Today it is recognised as the premier event of its kind in Australia. The following year in 2005, the associated touring exhibition was begun and last year 110,000 people viewed the exhibition in seven venues in three States and the ACT. In 2007, a search was initiated for a permanent dark sky site for the Society's regular monthly viewing nights. It is planned that an observatory and club house will be built at the site to further our aims. We look forward to meeting many new members and to further encourage and promote amateur astronomy in the Central West. Created by Peter Crute of Odyssey Technology for the Central West Astronomical Society. Last updated by John Sarkissian 22nd of April 2019. Copyright Central West Astronomical Society 2002 - 2019. All Rights Reserved.